The cornerstone of the Concord Collection is quality, and this incandescent semi flush is no exception. Combining a classic brushed nickel finish and posh styling, you will find no better way to highlight the charm of your home. With the superb craftsmanship and affordable price this fixture is sure to tastefully indulge your extravagant side. There is a limited one year warranty on this item. For more information please contact 1-800-755-0155. The cornerstone of the concord Collection is quality, and this semi flush is no exception. Combining a classic bronze finish and posh styling, you will find no better way to highlight the charm of your home. With the superb craftsmanship and affordable price this fixture is sure to tastefully indulge your extravagant side. A new category of vintage modern fixtures takes center stage. Delicate details and warm finish options, including Graphite and Brushed Nickel, create statement making focal pieces for a variety of interiors. Debut provides a fitting stage to feature nostalgic, vintage lamps. Glass accessory shades in clear or frosted seeded finishes are available to complement traditional incandescent or energy efficient lamps. This convertible semi-flush features a classic design with metalwork finished in brushed nickel and a beautiful white glass shade. Includes 6-ft of chain and 10-ft of wire for easy conversion to a pendant. 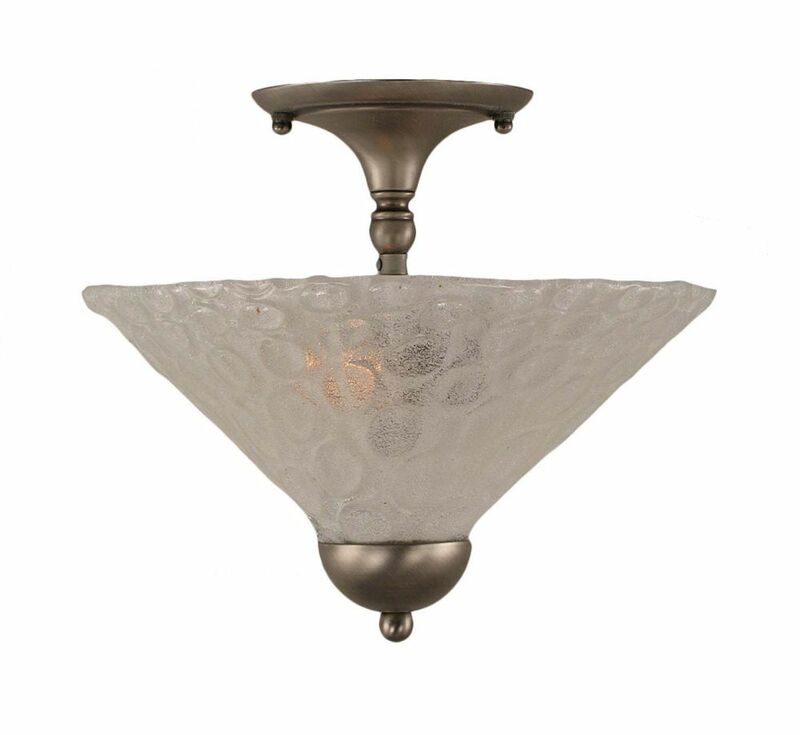 Concord 2 Light Ceiling Brushed Nickel Incandescent Semi Flush with a Clear Crystal Glass The cornerstone of the Concord Collection is quality, and this incandescent semi flush is no exception. Combining a classic brushed nickel finish and posh styling, you will find no better way to highlight the charm of your home. With the superb craftsmanship and affordable price this fixture is sure to tastefully indulge your extravagant side.